Wednesday 30th January – Australian Market Wrap | Beeks Downunder-Because not all financial news is boring! Apple results set the tone but after an initial strong 37 point rise we turned negative in early afternoon before a late closing rally saved some blushes with the ASX 200 up 12.5 to 5887.A strong day in iron ore miners rescued the ASX as banks once again under pressure. A downgrade from AIZ hurt QAN. 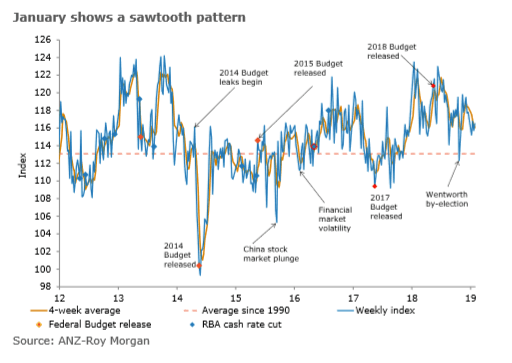 Economic news on the CPI hardly moved the dial, although the AUD pushed a little higher. Earnings downgrades from GUD did not help industrials. Star performers in the large caps were BHP, RIO and FMG and in the small cap space new entrant SPT had another 70% rise today. Another good performer was BAL on a Morgan Stanley upgrade and gold miners fared well too. ASX 200 up 12.5 to 5887 as rally falters. Iron ore miners the focus. Vale cuts production and Asian ore moves higher. Banks steady at lower levels. AUD gains on CPI to 71.95c. Aussie Gold steady at $1826 as AUD strengthens. US futures give up Apple gains up 10 points. QAN -5.09% Air New Zealand downgrade takes its toll. NST +4.10% gold producers in demand. RIO +4.51% strong iron ore price. SDA +2.14% contract win in UK. FNP – unchanged – update on nutritional capability and dairy acquisition. GUD -9.02% half-yearly reports with weak outlook. AIA -3.88% Michelle Kong into Future Director program. MMS -2.66% merger with ECX in doubt. GRR +4.88% iron ore price rise. TLS – unchanged – blames NBN for job losses. TPW +11.17% defies housing downturn. WGX +5.64% AUD gold price. PET +5.56% buyers coming back in. CAT -10.80% bad earnings numbers. PPS -6.67% Brexit woes perhaps. The speculative stock of the day: Splitit (SPT) +69.74% following yesterday’s highly successful IPO and a 90% it has backed up today with another good performance although more volatile. Zip Co (Z1P) -2.58% Unaudited Q2 revenue up 28% on last quarter, up to $19.2m, boosted by an 82% rise in transactions (up to 1.2m) and a 60% lift in transaction volume (up to $204.4m). The company also reported a 10% rise in merchants and 20% rise in customers on the prior quarter. Quarterly cash EBTDA rose to 1.7% of average receivables, up from 0.3% in Q1. GUD Holdings (GUD) -9.02% 1H19 underlying NPAT from continuing operations fell short of estimates ($29.6m vs $31.2m), as did revenue from continuing operations ($220.0m vs $224.0m) and EBIT ($43.9m vs 46.7m). An interim fully franked dividend of 25c has been announced. The company is expecting similar performance in the automotive businesses going forward, with organic growth and a full year of contribution from Disk Brakes Australia to assist. Air New Zealand (AIZ) -14.29% The company now expects earnings before taxation of $340 – $400 m for the year ended 30 June 2019. The previously announced guidance was for underlying earnings before taxation of $425 – $525 m, which excluded an estimated $30 – $40 m impact of schedule changes prompted by the global Rolls-Royce engine issues. The Rolls-Royce engine issues continue to be challenging for the business, but AIZ expected improvement as the year progresses. Syrah Resources (SYR) -13.43% Q4 graphite production of 104kt in line with guidance of 101-106kt. December production was impacted by equipment interruption that has now been resolved. FY19 guidance of 250kt graphite production, C1 cash costs moving from $550/tonne down towards $400/tonne through the year and recovery trending to a medium-term target of 88%. Newcrest Mining (NCM) +3.57% Q2 gold production up 19.5% on last quarter, copper production up 7.6% and AISC down 7,5%. FY19 production guidance is unchanged. Sandfire Resources (SFR) +3.33% December quarterly report shows copper production (-5.8%) and gold production (-6.4%) both fell from last quarters numbers. The company maintains FY19 guidance while lowering expected C1 costs to $0.90-0.95/lb from $1.00-$1.05/lb. Australia Consumer Price Index (CPI, December quarter): Headline +0.5% (survey: +0.4%) to +1.8%/yr (survey: +1.7%/yr); Trimmed Mean: +0.4% (survey: +0.4%) to +1.8%/yr (in-line); Weighted Median: +0.4% (survey: +0.5%) to +1.7%/yr (in-line). Financial conditions were mixed, with current financial conditions gaining 2.2% and future financial conditions declining by 0.9%. 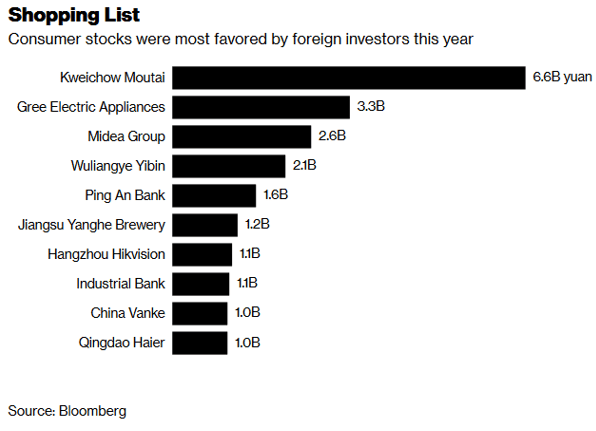 International investors are back shopping for bombed out Chinese stocks. 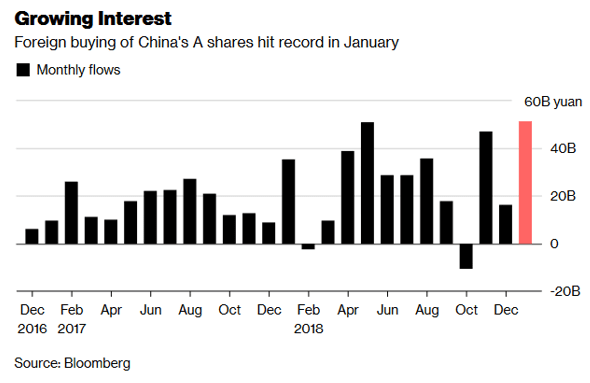 Foreign buying in A stocks hit a record in January. Consumer names accounted for six out of the 10 stocks taking most inflows from across the border. The UK is set on a similar collision course with the EU, that the Titanic sailed into. The question is which one is the iceberg and which is the ship. UK parliament though has now given PM May the authority to go back to Brussels and renegotiate a better deal. Steve Mnuchin is trying to separate the moves against Huawei from the trade talks. Media reports that Venezuela has 20 tonnes of gold ready to ship to an unknown destination. This represents the last remaining hard assets left in the country. 20 tonnes is around US$840m worth and around 20% of the central bank. A Russian plane has turned up to collect it according to reports. And finally I am forever indebted to my generous senders of jokes and snippets…thanks Alan. Rebuilding New Orleans after Katrina often caused residents to be challenged to prove home titles back hundreds of years.That is because of community history stretching back over two centuries during which houses were passed along through generations of family, sometimes making it quite difficult to establish a paper trail of ownership. A New Orleans lawyer sought a FHA rebuilding loan for a client. He was told the loan would be granted upon submission of satisfactory proof of ownership of the parcel of property as it was being offered as collateral. It took the lawyer 3 months, but he was able to prove title to the property dating back to 1803. After sending the information to the FHA, he received the following reply. The loan was immediately approved! And to Hans for this one…. The room got quiet. Finally, a man in the middle of the group raised his hand.